One of the more popular approaches utilised in the management of cerebral palsy, the NDT Approach also know as Bobath Approach, was developed in the 1940's by Berta and Karl Bobath, based on their personal observations working with children with cerebral palsy. The basis of this approach is that motor abnormalities seen in children with Cerebral Palsy are due to atypical development in relation to postural control and reflexes because of the underlying dysfunction of the central nervous system. This approach aims to facilitate typical motor development and function and to prevent development of secondary impairments due to muscle contractures, joint and limb deformities. Although the effectiveness of NDT in Cerebral Palsy has been questioned by some published reports, there are some studies suggesting its effectiveness. Constraint-induced Movement therapy is used predominantly in the individual with Hemiplegic Cerebral Palsy to improve the use of the affected upper imb. The stronger or non-impairmed upper limb is immobilized for a variable duration in order to Force Use of the impried upper limb over time . 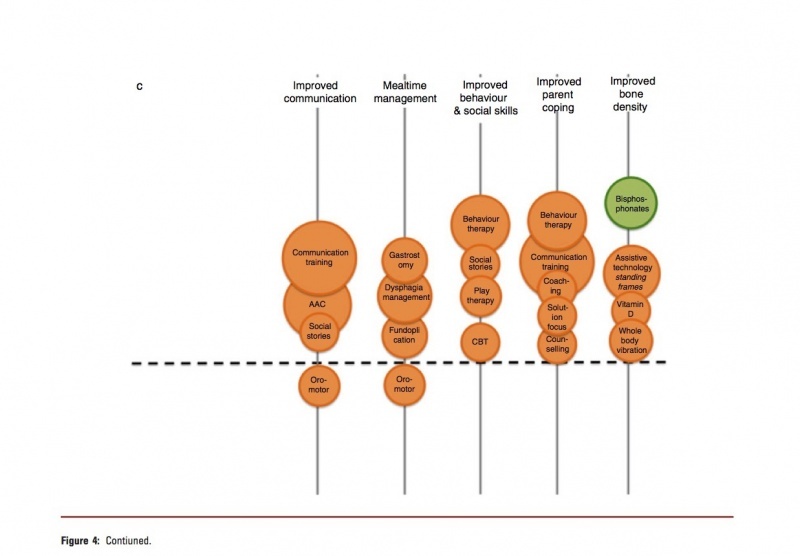 Antilla et al (2008)  identified one high and one lower-quality trials which measured both body functions and structures, and activity and participation outcomes through use of CIMT. Use of a cast with CIMT showed positive effects in the amount and quality of functional hand use in th eimpaired limb and new emerging behavior as compared to the no-therapy group, but no effects were found on QUEST. Use of sling during CIMT also had positive effects on functional hand use on teh impaired upper limb, time to complete tasks, and speed and dexterity, but no effects on sensibility, handgrip force, or spasticity. Thus Antilla et al (2005) found there is moderate evidence for the effectiveness of CIMT therapy on functional hand use in th eimpaired upper limb . According to Patel (2005) the efficacy of this approach has not been established, in particular in relation to the adverse effects of prolonged immobilization of the normally developing upper limb . The presence of increased tone can ultimately lead to joint contracture and changes in muscle length. When we look at the use of stretch to normalise tone and maintain soft tissue length we employ a slow, prolonged stretch to maintain or prevent lofss of range of motion. While the effects are not entirely clear the prolonged stretch produces inhibition of muscle responses which may help in reducing hypertonus, e.g. Bobath's neuro-developmental technique, inhibitory splinting and casting technique. It appears to have an influence on both the neural compnents of muscle, via the Golgi Tendon Organs and Muscle Spindles, and the structyural components in the long term, via the number and length of sarcomeres. Studies in Mice show that a stretch of 30 mins daily will prevent the loss of sacromeres in the connective tissue of an immobilised muscle, although the timescale in humans mey not relate directly. Splints and casts are external devices “Splints and casts are external devices designed to apply, distribute or remove forces to or from the body in a controlled manner to perform one or both basic functions of control of body motion and alteration or prevention in the shape of body tissue.” Splinting can be used to produce low-force, long duration stretching although there is a dearth of evidence to support this. A wide range of splint have been used to influence swelling ,resting posture, spasticity, active and passive ROM. S, Jain et al (2008). Effect of serial casting in spastic cerebral palsy.. Indian J Pediatr. 2008 Oct;75(10):997-1002. doi: 10.1007/s12098- 008-0100-z. Epub 2008 Jun 23. The goal of the electrical stimulation is to increase muscle strength and motor function. Electrical stimulation is provided by Transcutaneous Electrical Nerve Stimulation (TENS) Unit which is portable, non-invasive and can be used in the home-setting by parents or the patient. Neuromuscular Electrical Stimulation (NMES) involves application of transcutaneous electrical current that results in muscle contraction. NMES has been postulated to increase muscle strength by increasing the cross-sectional area of the muscle and by increased recruitment of type 2 muscle fibers. Functional Electrical Stimulation (FES) refers to the application of electrical stimulation during a given task or activity when a specific muscle is expected to be contracting. Patel (2005) has shown there is some evidence to support the use and effectiveness of NMES in children with Cerebral Palsy but found that many of the studies are limited by confounding variables including concomitant use of other therapies, wide variation in methods of application, heterogeneity of subjects, difficulty in measuring functional outcomes and lack of control subjects . Mintaze (2009) proposes that neuromuscular and threshold electrical stimulation as a modality in Cerebral Palsy is used for strengthening the quadriceps muscles in ambulatory diplegic children with Cerebral Palsy, who have difficulty with specific resistive strength training . Total score for the level of evidence (calculated by reverse coding of the Oxford Levels of Evidence, i.e. expert opinion=1, randomized controlled trial [RCT]=5). Location of the circle on the Y-Axis of the graph corresponds to the GRADE System Rating. 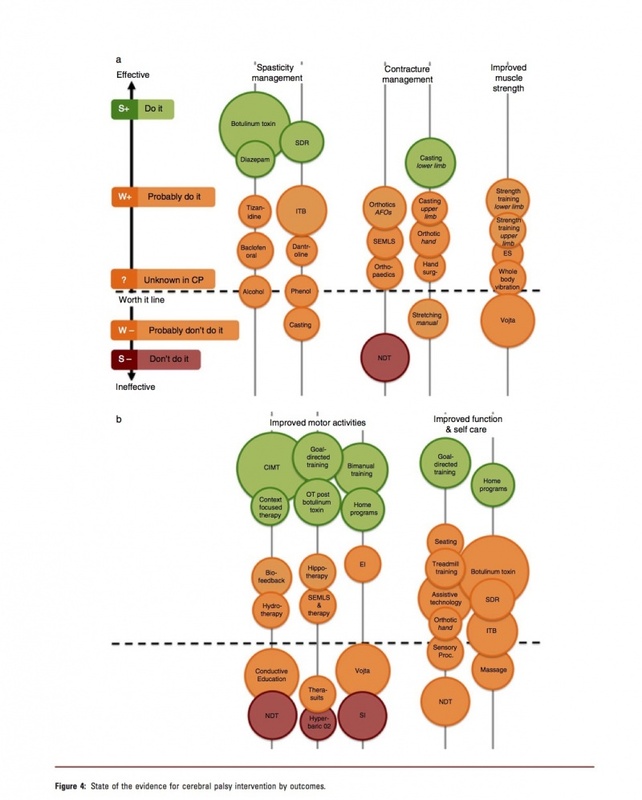 You can review the article and more detail on their mechanism for rating the interventions at Novak I, Mcintyre S, Morgan C, Campbell L, Dark L, Morton N, Stumbles E, Wilson SA, Goldsmith S. A systematic review of interventions for children with cerebral palsy: state of the evidence. Developmental Medicine & Child Neurology. 2013 Oct 1;55(10):885-910. Effects of Intensive versus Non-Intensive Physical Therapy on Children with Cerebral Palsy. ↑ 1.0 1.1 1.2 Günel MK. Physiotherapy for children with cerebral palsy. INTECH Open Access Publisher; 2011. ↑ 2.0 2.1 2.2 2.3 2.4 2.5 2.6 2.7 2.8 Patel DR. 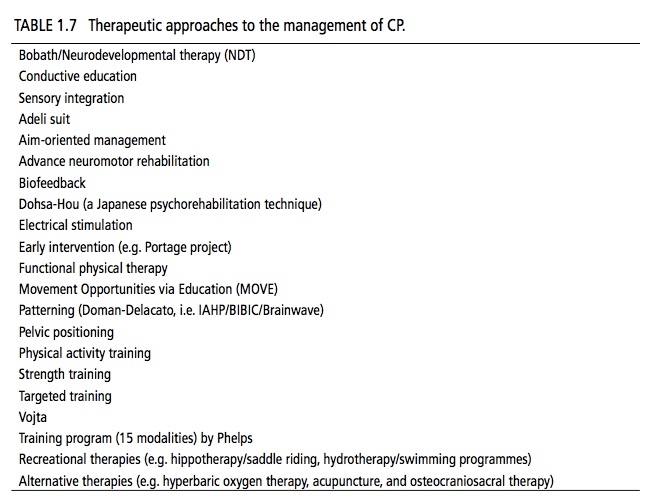 Therapeutic interventions in cerebral palsy. The Indian Journal of Pediatrics. 2005 Nov 1;72(11):979-83. ↑ 3.0 3.1 3.2 3.3 Anttila H, Autti-Rämö I, Suoranta J, Mäkelä M, Malmivaara A. Effectiveness of physical therapy interventions for children with cerebral palsy: a systematic review. BMC pediatrics. 2008 Apr 24;8(1):1. ↑ Anttila H. Evidence-based perspective on CP rehabilitation: Reviews on physiotherapy, physiotherapy-related motor-based interventions and orthotic devices. ↑ 5.0 5.1 5.2 5.3 5.4 Mintaze Kerem G. Rehabilitation of children with cerebral palsy from a physiotherapist’s perspective. Acta Orthop Traumatol Turc. 2009;34(2):173-80. ↑ Sharan D. Recent advances in management of cerebral palsy. The Indian Journal of Pediatrics. 2005 Nov 1;72(11):969-73. ↑ 7.0 7.1 7.2 7.3 Novak I, Mcintyre S, Morgan C, Campbell L, Dark L, Morton N, Stumbles E, Wilson SA, Goldsmith S. A systematic review of interventions for children with cerebral palsy: state of the evidence. Developmental Medicine & Child Neurology. 2013 Oct 1;55(10):885-910.